Our couch was old. And decrepit. When we sat down we could feel that section shifting independently of the rest of the couch. Sometimes I had trouble getting the recliner out, because it was sagging so badly the footrest dragged the floor. The back, once level and uniform, had taken on a slight curve as the ends dipped away from the center. A few weeks ago my mate passed by a furniture store that was remodeling, and liquidating their inventory. He took advantage of the deals to purchase us a new couch, loveseat, end tables, and a coffee table. The only downside to driving a Honda Fit is that you can’t haul furniture in it. The store said they’d be able to deliver our stuff this Thursday or Friday. In preparation for the new couch, I called the city and arranged for a “bulky item pickup.” They said to have the old couch out by the street on Thursday morning, and they’d come take it away for us. Wednesday evening, my husband and The Artist set about getting the couch out to the street. My husband is six feet, two inches tall. The Artist is an inch or so taller. They’re both solid, broad-shouldered men. The couch didn’t want to go. The couch fought back. My husband got on one end, The Artist on the other. They lifted both ends and tried to walk to the door. The center of the couch dragged on the ground. They adjusted their positions so they could lift the center as well. They managed to get the end of the couch into the door frame. The back of the couch sagged backwards, wedging it. They had to maneuver around the television. For some reason they decided it would be easier than moving the television so they could take the couch straight out. The Artist suggested they turn the couch at an angle, to present a smaller profile to door frame as they went through. The feet of the couch tried to cling to the frame of the door. Finally they had it clear of the door. In a last desperation move, the couch went completely limp—the three sections sagged apart, barely connected. But it was too late, and the triumphant movers had no mercy. “Tilt it up on end and just let it fall down the stairs,” instructed my husband. They walked it out to the curb that way, levering it up on end and dropping it down. By the time I got back from class Thursday, the old couch was gone. I rented a Rug Doctor and shampooed the carpet. My husband called to find out when we needed to be home to receive the new couch. Bad news. Carolina Sofa is moving its inventory to a new location on Thursday and Friday. They knew this well in advance, and yet they continued to schedule deliveries for those dates. Swell. They’ll be able to deliver it Monday (they say). 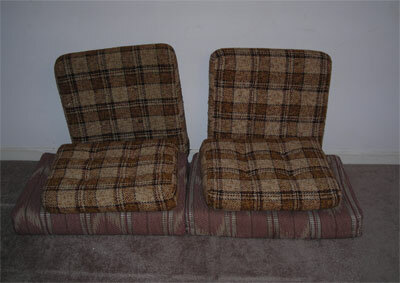 We’re spending the weekend with an impromptu couch made of old couch cushions. The kids thought it was exciting and different on Thursday. By Friday night they were already tired of it. “I wish our new couch was here,” remarked The Artist. It’s a bit annoying. Still, as I told The Artist, I can’t get too bent out of shape when I read about people who lost their homes during Katrina and are still living in hotels.